Paul Aguirre: I’m a big Nyquist fan. I can’t go beyond him. I love that horse. A.C. Avila: It’s wide open. It’s a jockeys’ race. Alexis Barba: Nyquist, but if it rains I’d throw (Paddy) Gallagher’s horse (the maiden Trojan Nation) in there. A horse I trained, Make Music for Me, was a maiden at 30-1 when he ran fourth in the 2010 Derby over a sloppy track, beaten only five lengths (by Super Saver). Ray Bell: You have to like Nyquist, with Exaggerator and Mor Spirit. Mo Tom has the right style at a price. David Bernstein: I’m a Nyquist fan until they beat him. He’s got a good post. Jim Cassidy: Nyquist, I guess. Ben Cecil: (With a Cheshire cat smile adorning his face)–Do I have to say? Nyquist, and I genuinely like him, not just because I train for Paul Reddam (owner of the colt). Caesar Dominguez: Nyquist and Exaggerator, with Victor Espinoza (Whitmore) third. Neil Drysdale: Nyquist, if all is well. Michael Ewing: Nyquist is straightforward. If it’s an off track, Exaggerator can do it. Jerry Fanning: Nyquist. The rest is wide open. Mark Glatt: Exaggerator. 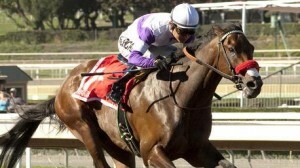 I liked the way he ran in the Santa Anita Derby and the pace probably sets up for him. Jorge Gutierrez: Nyquist and Exaggerator. Dan Hendricks: I’m leaning towards Creator. Jerry Hollendorfer: Nyquist, and I hope he (O’Neill) wins the Oaks (with Land Over Sea, who finished second to unbeaten champion Songbird trained by Hollendorfer in five straight races). David Hofmans: I’m pulling for Exaggerator. He’s trained by a small guy (nationally, Keith Desormeaux), but Nyquist is the real deal. Steve Knapp: Nyquist. He’s done everything right. Brian Koriner: I’m a hometown guy. I like Nyquist. Everyone says racing in California is no good, but come Derby time, it’s all right. (Southern California-based horses have won the Derby three of the last four years: I’ll Have Another, 2012; California Chrome, 2014; and Triple Crown winner American Pharoah last year). Eric Kruljac: I’m rooting for all the California boys. I would love it if Cliff (Sise Jr., Danzing Candy) could win it. Talk about a comeback story. Craig Lewis: Nyquist, but if Danzing Candy gets an uncontested lead, he can make it. Mike Machowsky: Gun Runner. I was impressed with his win in the Louisiana Derby, and at least he’ll offer a little value. I like (Dale) Romans’ horse, too (Brody’s Cause). Alfredo Marquez: Nyquist and Exaggerator. Ron McAnally: I’ve got to go with The Genius (Bob Baffert and Mor Spirit). Either him or Asmussen (Creator). Jeff Metz: Nyquist and Exaggerator. Steve Miyadi: Sise (Danzing Candy) wire to wire. Hector Palma: I have to like Nyquist. He never lost. Dean Pederson: It’s hard to go against a horse like Nyquist that has a bunch of ones next to his name. Mike Pender: Mo Tom. He was sawed off in his last three starts and had no chance. It’s time to show his colors. Jorge Periban: Nyquist. He’s been running great. Marcelo Polanco: Exaggerator. I like the way he won in the slop and he’s got a smart rider (three-time Derby winner Kent Desormeaux). Mike Puype: The two California horses, Nyquist and Exaggerator. John Sadler: I’ve got to pick Nyquist. I think he’s the best horse. John Shirreffs: Nyquist. For a longshot, Suddenbreakingnews. Gary Stute: Nyquist. He hasn’t done anything wrong yet. Eddie Truman: Nyquist is not only my Kentucky Derby pick, he’s my Triple Crown pick. I’m going all in. Tim Yakteen: Nyquist. I’m going with the favorite.